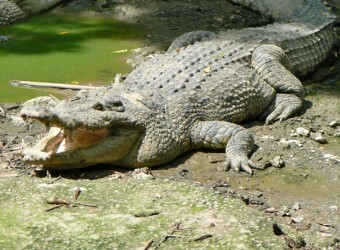 Crocodile Park is located in the middle east of Bali and about 15 min. drive from Tabanan. You can try feeding and the show is also held. Crocodiles are slow most of the time, however, you will be surprised their movement just after giving food. They are waiting with sharp fangs and eyes. You can also watch eggs and baby crocodiles. When I gave the meat, the crocodile jump up quickly to get and eat the meat! I was a little impressed with this. Children were very happy to see it. I imagined what will happen if the crocodile break the fence and attacked us. It was the first time for me to see crocodile eggs directly. Crocodile eggs were big!! I was scare, but it was exciting to see it.